Recently, Skype introduced Skypecast and you have seen webcasts and heard Podcasts today .. Pageflakes gives you Pagecast. Using the Page publishing feature in Pageflakes, you can make your pages public and share with the world and thus make Pagecast! Your own page, you can put almost anything you want. From news feeds, photos, audio, podcasts, movies to etc. Not limited to that you can also add your productivity cool widgets like Calendar, To-do-list, Blog, Notes. You are no longer limited to providing video via Webcast or audio via Podcasts. You can deliver rich interactive content via Pagecast. 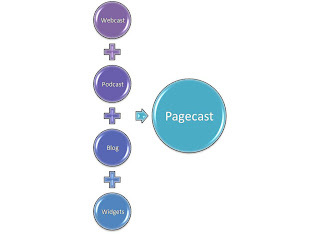 Pagecast is a lot more powerful than blogging or vblogging because you can deliver blog content along with video, audio, and hundreds of rich interactive components .